Having women permanently seated on councils and quorums of the church is certainly an improvement over having men meet alone and solicit female feedback only when they happen to realize that it is needed. Feedback is not enough because it excludes women from bringing in ideas at the beginning of the process and participating in final decision making. The new policy of including women on these councils demonstrates that just because men have always excluded women from certain opportunities in the past does not mean that including women is impossible or unnecessary. I hope that barriers have been broken and eventually all male-only Mormon councils and quorums will welcome female members. While including one woman in a council is a big improvement over banning women altogether, the women serving on these councils will be outnumbered by men by a ratio of four or five to one. Researchers at Brigham Young University and Princeton have found that women are less likely to contribute to meetings when they are outnumbered by men. Reference C Of course, including women in all councils of the church in approximately equal proportions with men is a logistic impossibility while only nine women are considered eligible to participate in any general-level council. Which leads to a question—why only nine women? Wouldn’t women be better represented by a greater number of women in general-level leadership who could better reflect the diversity of the female population of the church? 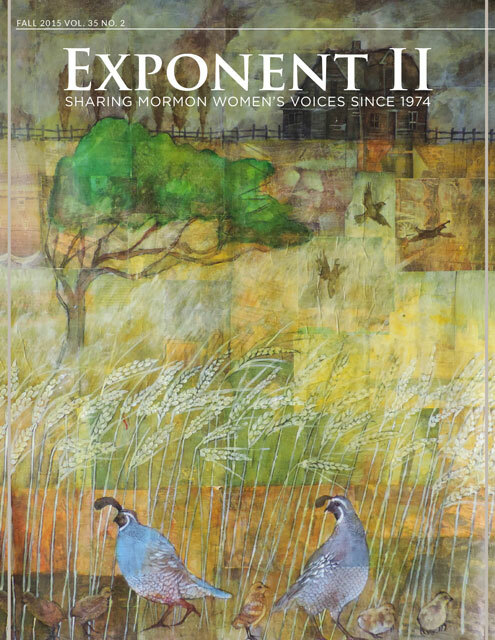 I also question why church leaders felt it necessary to change the name of the Priesthood Executive Council to the Priesthood and Family Executive Council in order to add a woman. Elder Ballard has said that “all who enter the house of the Lord officiate in the ordinances of the priesthood. This applies to men and women alike.” Reference D Elder Oaks has said that women have “the authority of the priesthood in their Church callings.” Reference E If women are already officiating in priesthood ordinances and receiving priesthood authority, wouldn’t a woman be a natural fit for a priesthood council? This council name change is a tacit acknowledgement that in spite of more gender-inclusive rhetoric about priesthood in Conference talks, in practice, priesthood is still treated as equivalent to maleness. I also think it is curious that the church did not make an official announcement about this. I am encouraged by this that they are discussing women’s issues and looking for small ways to change things. As much as I wish change would come faster and that they would own up to the fact that they’ve been wrong and change is necessary, I am resigned to the fact that this is what change will look like for the long haul, small, silent baby steps. The OW issue is clearly in their minds, as it seems like they want to avoid they very appearance of allowing women into something with the label “priesthood” on it. Breaking this news on Facebook is interesting to me, too. There’s such palpable tension each time the Church takes a baby step toward gender equality. In this case you have Pres. 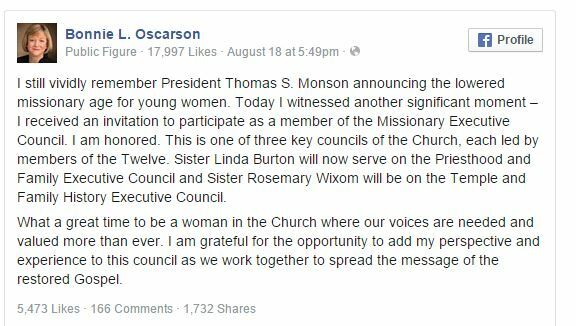 Oscarson and the Deseret News calling this a “significant” move, which is thrilling and demonstrates how women have always been so valued and included. On the other hand you have people commenting on the Deseret News piece that the Church is unchanging and this isn’t really a change at all, so stop looking in the tea leaves for meaning in this. The truth is, the Church at the highest administrative levels on down to local units has not systematically valued or included women’s perspective and spiritual gifts for a long time, if it ever did, and this week a small step was made toward rectifying that. The tension comes from trying to spin the news in a way that makes the Church look good, without acknowledging that truth. “Watch what I do not what I say” is an old adage for good reason. We have longed known that we were neither valued nor listened to, although we’ve always important due to the countless acts of service we perform. You make a valuable point when you note that having a permanent seat on the committee doesn’t guarantee an equal voice. And being able to voice an opinion doesn’t mean it will be heeded. And the lone woman isn’t equal because she doesn’t hold the PH. Nice try Elder Oaks, but that talk was just given for what was going on at that precise time in history. It had no residual effect. Love this post, April. Your observations are spot on.